Spring is almost upon us and before you know it it will be summer time. A fantastic time for warm evening walks with your dog, long games of fetch and pottering about in the garden. Of course, one thing to watch out for in the hot weather is dehydration, as our dogs can sometimes over do it and get over heated. 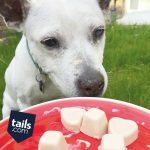 There are many different ways of helping to cool your dog down on hot summer days, such as adding ice cubes to their water bowl or providing an icy treat, and of course trying to keep them in the shade (although that one is not always easy). 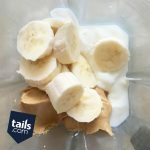 Most dogs are very keen on the flavour of bananas which is great, as bananas are a great, healthy snack for our canine pals. Bananas naturally contain an array of vitamins and minerals which can all provide a boost to your dog’s nutrient levels. In particular, they contain good levels of vitamin B6, vitamin C, manganese and potassium. 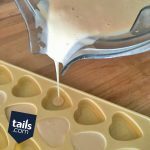 We thought this would be a great time to try making some dog friendly ice cream to help cool down your pooch. Being a white Staffy with pink ears, office dog Bandit needs to be careful to not spend too much time in the sun, which is unfortunate as, like most Staffies, she loves to sunbathe. Bandit approves of this recipe so much, she insisted that we name it Bandit’s Banana Bonanza. Pop the ingredients into a blender until everything is mixed well and has a smooth consistency. You should be able to fill about 5 or 6 ice cube trays. Leave the trays in the freezer for a few hours and there you have it. They’ll be ready to serve to your pooch. 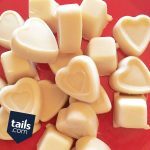 Please do let us know how you get on and what your dog thinks of this yummy, tasty, cool snack. That’s what a dog for, I guess haha. But that’s just too cute. I’ve been making these for my dog for a while. He loves them as little treats after a long walk or during the night when it seems to get much hotter in our home. Biggest problem is that kids seems to love them too and will do the old ‘one for you, two for me’ trick that youngsters excel at. As for other flavors, I’ve made one using carob drops, instead of using peanut butter I used a small amount of honey, he didn’t like it as much as the banana ice cream but he does love carob. But he also only has them every now and again, I’ve also been told we can use strawberries but I’m yet to try them. I also use a few toppers every once in a while, kids get sprinkles so only seems far the dog should have his version. I use cooked bacon that we’ve crumbled up, a teaspoon of apple sauce, or a tiny drizzle of honey. They go down a storm. I usually use homemade treats on the rare occasion, but with the weather getting much hotter, and the dog being as large as he is I’ll probably have to start making more ice cream to help him stay cool. When I make a roast dinner, I’ll keep meat stocks, allow them to cool and freeze the stock in ice cube trays. They go down a storm. That could be another thing to try during this hot weather. No doubt kids love them too, I actually like them myself. It’s really fun to explore different flavors.